If you smell gas, think you have a gas leak or have any concerns regarding carbon monoxide, immediately open all windows and doors and extinguish any naked flames including cigarettes, then call the Gas Emergency Services free on 0800 111 999(1). This is a national number and is available to all areas. Your electricity network distributor looks after your electricity supply. If there’s an electrical emergency or power outage at your home, you’ll need to ring your operator. Simply call 105 from your mobile or landline and the telephone service will automatically direct you to the network distributor's emergency number for your area. Calls to this service are free of charge. 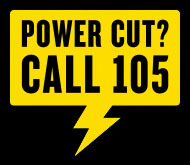 Get more information on the power cut call 105 service. Alternatively, you can call EDF Energy on 0333 200 5100(1) to find out who your electricity provider is. If it’s not an emergency and you just have a question, please visit our Help centre. What can I do if there is a power cut? Can I have a free gas safety check? What should I do if I think I have Carbon monoxide poisoning?